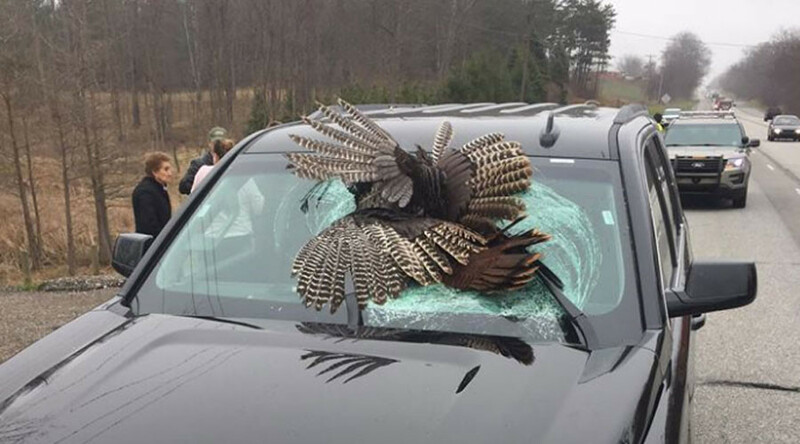 A 30lb turkey met its maker after it smashed through an SUV in northern Indiana, lodging itself in the windshield. The dramatic incident happened as a family visiting La Porte County from New Jersey were making their way back to O'Hare International Airport in a rental car. The large bird caught the family unaware as it flew into their path and crashed into the vehicle’s windshield. The tom turkey was killed on impact while the family only received minor cuts from the shattered glass, according to La Porte County Sheriff's Office, who published images from the scene to their Facebook page showing the wild turkey lodged in the glass. Police are warning drivers that, as it’s mating season for wild turkeys, they’re “often on the move” and can be as hazardous as deer, although they admit such an incident is rare. "I’ve been a policeman for 31 years and I’ve never seen something like that," one officer told IndyStar. A similar turkey smash took place in Monroeville, Pennsylvania, in recent days – this time the target was a library window. The turkey was killed in the event. Last week the New Hampshire Fish & Game Department also reported a crash involving an 18lb turkey and a lorry.